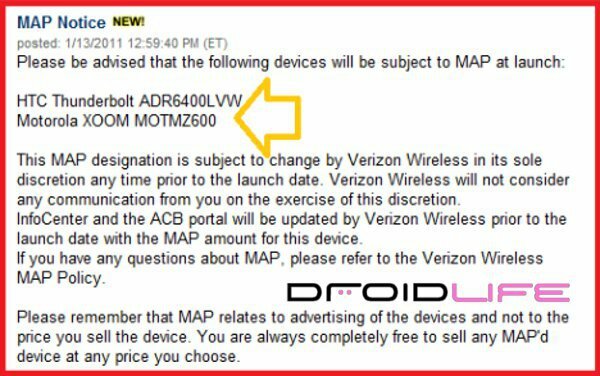 According to our sources and the shot above, Verizon is readying their in-store marketing push for the HTC Thunderbolt and Motorola XOOM. Both will apparently have a variety of posters, window clings, etc., but more importantly are looking like they will launch around the same time. We received word yesterday that the TBolt is currently scheduled for a “last week of February” launch, but rumors suggest that the XOOM could be even earlier. Also featured is another shot and confirmation of the XOOM’s model of MOTMZ600 which we first uncovered back in August. We’re getting closer to some monumental releases for Android, and even with that bootloader story floating around about Motorola, you can’t deny that the XOOM is the tablet to have.